HR Safety will be a recognized leader by customers, regulators, and peers in establishing an effective safety culture which holds employees at all levels accountable for safety performance. HR Safety will partner with all City of Houston departments in meeting the shared responsibility of providing a safe work environment for all city employees. Collaborative: Create and sustain broad and sincere relationships among individuals and organizations to encourage trust, advocate a team atmosphere, build consensus, and facilitate communication. Comprehensive: Consider and take into account all hazards, Departments and all impacts relevant to workplace safety. Coordinated: Synchronize the activities of all Departments to achieve a common purpose. Flexible: Use creative and innovative approaches to reach the safety goals of the City. Integrated: Ensure unity of effort among all levels of management and employees of the City of Houston. Productive: Generate results, benefits, and products to protect the reputation and integrity of the City. Progressive: Anticipate future risks and vulnerability, and take preventive and preparatory measures to build a proactively safe work environment. Risk and Data Driven: Use sound risk management principles (hazard identification, risk analysis, and impact analysis) and data in assigning priorities and resources. Safety Committee Meetings will be held every third Tuesday of each month from 1 to 2 p.m. at 900 Bagby, 3rd Floor, Room 382, Houston, Texas 77002. If you have any questions please contact (832) 393-7233. 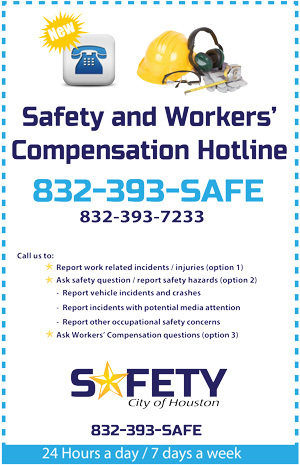 View the contact list to see the city’s workers’ compensation Designated Department Representatives, FMLA Coordinators and Payroll Representatives, etc.